For those who are hard of hearing, everyday tasks such as knowing when to answer the door can become difficult. Often, the chime of a regular doorbell simply isn't loud enough to make the arrival of someone at the door known. The Bellman Visit Push Button Transmitter for the Hard of Hearing provides a solution to this, allowing the user to keep track of the coming and goings of visitors to their home. The dual-purpose device also acts as a personal alarm, so you will always be able to call for assistance if needed. How Does the Bellman Push Button Transmitter Work? A wireless doorbell, the Push Button Transmitter detects events in the surrounding area and transmits this to your existing Bellman receiver. If the doorbell is pressed, the user will pick up this transmission as either a light, sound or vibration signal. Different signal patterns can be customised, enabling users to choose individual alerts for use on multiple doors. This way, a person of impaired hearing can always be aware of the activity of their home. 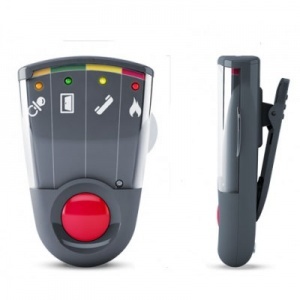 The Push Button Transmitter works as a portable alarm as well as a doorbell, giving users the option to easily notify others if ever in need of assistance by pushing the button and signalling the alert. The Push Button Transmitter will not withstand rain and is for indoor use, or outdoors in a sheltered location. It is compatible with other products in the Bellman Visit Range and works alongside a Bellman receiver, which can be purchased separately.